This book will change your life by showing you how life changes. Why does happiness get harder in your 40s? Why do you feel in a slump when you’re successful? Where does this malaise come from? And, most importantly, will it ever end? Drawing on cutting-edge research, award-winning journalist Jonathan Rauch answers all these questions. 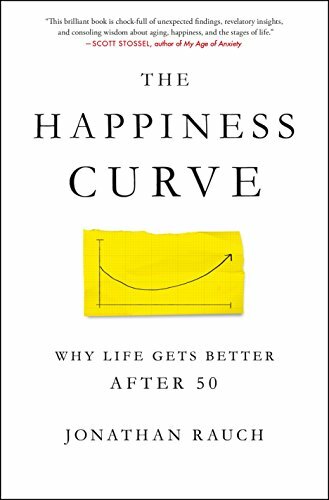 He shows that from our 20s into our 40s, happiness follows a U-shaped trajectory, a “happiness curve,” declining from the optimism of youth into what’s often a long, low slump in middle age, before starting to rise again in our 50s. This isn’t a midlife crisis, though. Rauch reveals that this slump is instead a natural stage of life―and an essential one. By shifting priorities away from competition and toward compassion, it equips you with new tools for wisdom and gratitude to win the third period of life. And Rauch can testify to this personally because it was his own slump, despite acclaim as a journalist and commentator that compelled him to investigate the happiness curve. His own story and the stories of many others from all walks of life―from a steelworker and a limo driver to a telecoms executive and a philanthropist―show how the ordeal of midlife malaise reboots our values and even our brains for a rebirth of gratitude. 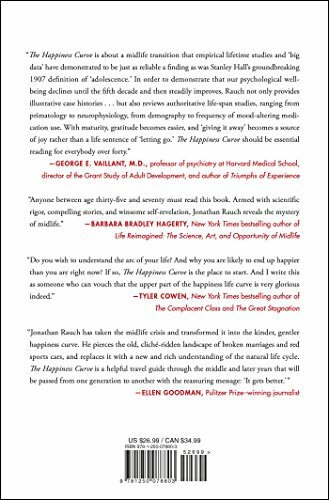 Full of insights and data and featuring many ways to endure the slump and avoid its perils and traps, The Happiness Curve doesn’t just show you the dark forest of midlife, it helps you find a path through the trees. It also demonstrates how we can―and why we must―do more to help each other through the woods. Midlife is a journey we mustn’t walk alone.